I’m starting to amass a large collection of infused/flavored simple syrups. Partly it’s that I keep surprising myself with how much syrup is left after I make a batch for a sorbet. And because I always just mindlessly make a 1 cup to 1 cup ratio every time I do a syrup. So yeah, a lot of these bottles. To try and start using them up I’ve been picking my brain for new ways to use them. Mint lattes? Why not! Basil lattes? No. Nononono… Adding them in to cocktails that I already know how to make? Sure, yeah, I guess. That basil syrup is sure a hard one to be clever with. However, going with flavor profiles I was familiar with, I decided on making a variant of a gimlet. With the addition of some fresh mint, this drink becomes very fragrant. The notes of both herbs are quite strong, but not powerfully “herbal”. Staying true to a gimlet, it’s also sweet and tart. Together it’s a lovely flavor combination. 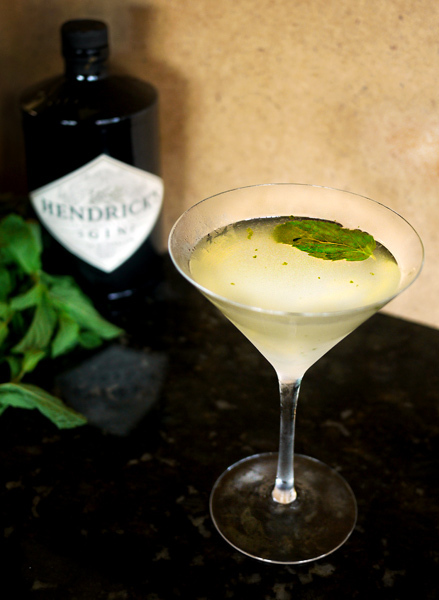 Muddle the mint and basil simple syrup together. Add gin, lime juice and fill shaker 2/3 full with ice. Shake and strain into a chilled cocktail glass. Garnish with one mint leaf.